Finished season one of The Crown? Still find yourself craving more stories from the early reign of Queen Elizabeth II? Here's a list of book recommendations to help you fill the void until season two premieres! Young Elizabeth: The Making of the Queen by Kate Williams. 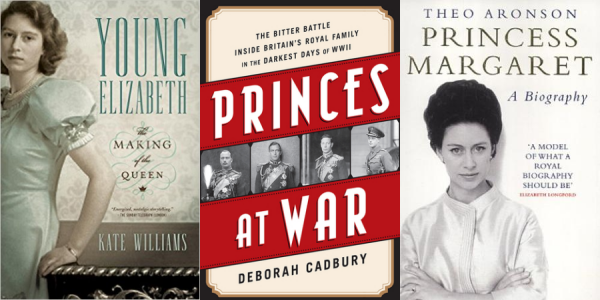 Lots of books have covered the early life of Queen Elizabeth II, but Williams does so in a particularly accessible way. When writing my recaps of The Crown, I consulted this book for details about Elizabeth's early reign more than once! Daughter of Empire: My Life as a Mountbatten by Lady Pamela Hicks. This highly entertaining memoir, written by Lord Mountbatten's younger daughter, is full of stories from her childhood and the period before her marriage. She was in Kenya with Philip and Elizabeth when King George VI died, and she also accompanied them on the 1953-54 Commonwealth Tour. She's a natural storyteller, and she gives great insights into the little details of life on a long royal tour. Princess Margaret by Theo Aronson. One of the newest additions to my royal bookshelf, this biography manages to capture Margaret's complicated life without being either overly critical or overly deferential. Wonder what was really going on during the Townsend Affair? Start here. Princes at War by Deborah Cadbury. For those who were intrigued by the relationship between the Duke of Windsor and King George VI, here's a biography about the two of them, as well as two of their younger brothers, the Dukes of Kent and Gloucester. This is a really fascinating read, and it covers the abdication crisis and the World War that followed. The Queen Mother by William Shawcross. This is the dense, officially-approved biography of Elizabeth Bowes-Lyon. It's a great reference, and it includes lots of letters both to and from the Queen Mum. (Since it's the official bio, though, don't expect lots of juicy gossip.) This book was super helpful in referencing timeline details for the show, and it illuminates the fascinating real life of a character whom I feel was given a bit of a short stick in the series. Alice: Princess Andrew of Greece by Hugo Vickers. One of my favorite royal biographies of all time, about one of the most intriguing royal women of the twentieth-century. Were you fascinated by Philip's mother, depicted in her nun's habit in the series? Learn all about the journey that led her from palaces to hospitals to a religious life. Disclosure: The links in this post are affiliate links from Amazon.com. I receive a small percentage of each sale made through one of the links on my site, and I put all of that revenue directly back into materials for review here on the blog.